Happy Valentine's Day! 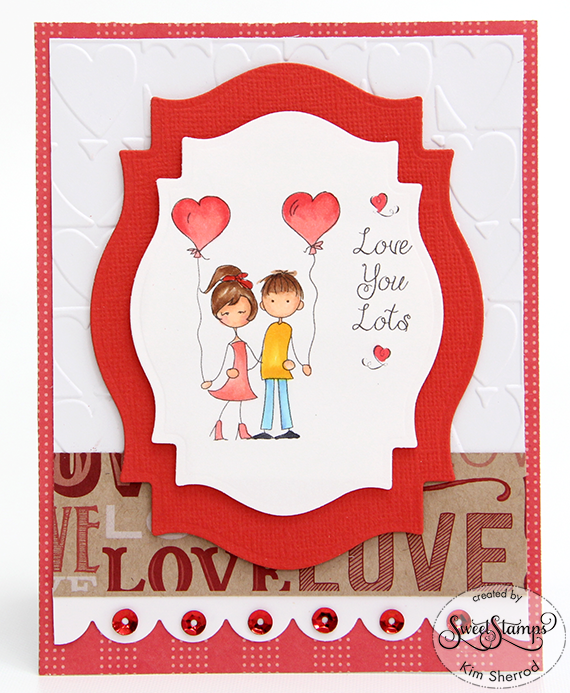 This sweet couple is from Sweet Stamps' Love You Lots stamp set. This is also one of those sets that could be used for many other special occasions. I embossed the white background using a heart embossing folder. The image was colored in using Copic markers. I die cut the image after I colored it using Spellbinder's dies and popped it up sung 3D tape. I also added a scalloped border die cut and placed some rhinestones on the scallops. Oh My gosh this is so cute! I love that embossed background! Thanks for playing along with us over at Art Impressions! Sweet card! Thanks for joining us st Glitter 'N' Sparkle! A sweet image and such pretty colours Kim, many thanks for joining in our February theme at Stamping Sensations challenge. This is super sweet! Thanks for joining us at Stamping Sensations this month.